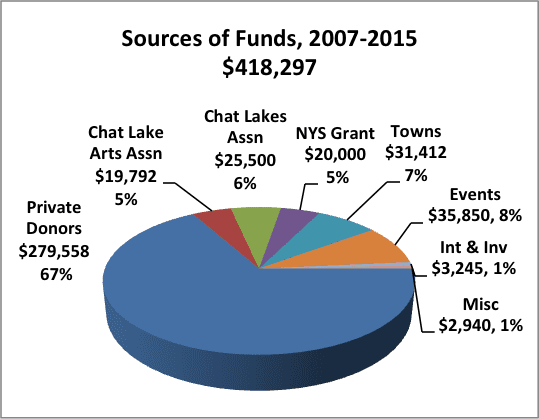 The Chateaugay Lake Foundation was formed in 2007 to raise funds and undertake projects for environmental protection of Chateaugay Lake. The immediate need and focus for fundraising has been stopping the spread of Eurasian water milfoil in lake waters. Of the more than $418,000 raised through the end of 2015, two-thirds has come from private donors, including many shore owners and their families. Nonprofit organizations, including the Chateaugay Lakes Association and the former Chateaugay Lakes Arts Association, have also provided major support. In addition, the Milfoil Control Project has received contributions from the surrounding towns of Bellmont, Ellenburg and Dannemora. In 2008, the Foundation received a start-up grant from New York State that helped with milfoil control at the Department of Environmental Conservation (DEC) public boat launch. Fundraising events, including a summer raffle and annual dinner, have become an increasingly important source of support. The majority of funds raised by the Chateaugay Lake Foundation go directly toward milfoil control—93 percent since the project began. This has allowed treatment by hand-harvesting of 70 of the most heavily infested acres, about 25 percent of infested acreage. Results are promising. Milfoil density is down significantly in the treated areas, but control needs to be maintained and expanded to the rest of the infested shoreline. 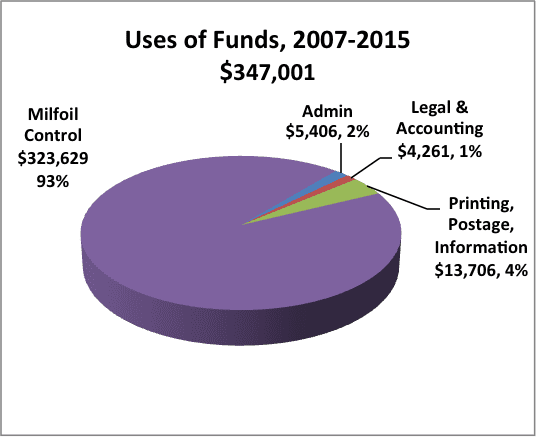 Go to News for more on how funds have been put to work each year.